For lunch today the kids and I wanted some oatmeal, but I didn’t have a lot of time. I went to the cabinet to get some instant oatmeal (don’t judge! ), and realized we were all out. So I decided to try making my own on the stovetop and the results were really good! This recipe made enough for me and my two boys with approximately the same amount as three packets of the instant variety. Make yourself a bowl and enjoy! In a saucepan, combine milk, water, butter, and vanilla and heat over medium heat, stirring regularly, until boiling. 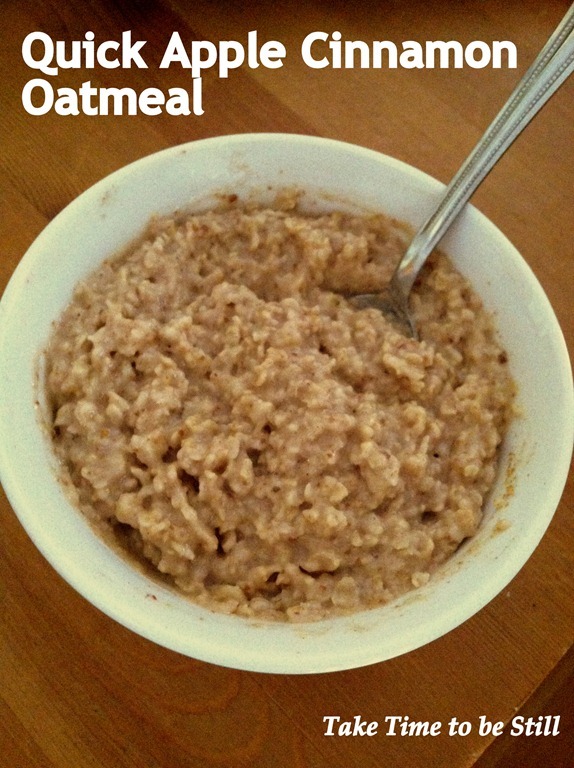 Stir in oats and spices and cook for 1 minute, stirring constantly, until thickened. Stir in applesauce and brown sugar (I used about 2 tbsp. and it was fairly sweet) and remove from heat. Stir in flax meal if desired, let sit for 2 minutes to cool and thicken and serve. This entry was posted in Meal Planning and Recipes, Mommy Mondays and tagged breakfast, Meal Planning and Recipes, mommy mondays, vegetarian by Julia. Bookmark the permalink.